The very name Bardolino (bar-doh-LEE-noh) takes me back years. After a day’s work at the chalk face, several of us would pile into the car and head off to our favourite Pizza Express restaurant in Coptic Street, near London’s British Museum. On a summer’s evening, a Bardolino was perfect with pizza because it had a touch of sharpness to the taste which made a splendid contrast to the pizza. Italians invariably claim that their wines are intended to go with food and this certainly seems to be the case. Now I admit that’s something of a generalization, because there are over a thousand different grape varieties grown in Italy. Getting to know that lot would be a lifetime’s undertaking. Many of the wines made from the more obscure grape varieties are largely for local consumption and rarely leave the country. Italy’s Ministry of Agriculture and Forestry has given authorized status to 350 grape varieties but I’d have thought that remembering their names is a bit of a challenge. On a good day, I can just about recall a couple of dozen of them. Italy, of course, is one of the oldest wine-producing regions in the world. The Etruscan and Greek settlers made wine there years before the Romans planted their own vineyards in the 2nd century B.C. 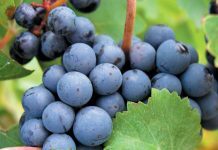 Although Italy makes wine from the so-called international grapes like Cabernet Sauvignon, Merlot and Chardonnay, the generic Italian wines are often more interesting. Despite the popularity of Italian restaurants in Thailand, you don’t see many Italian wines on the supermarket shelves or even in the specialist wine shops for that matter. The only Italian reds you’re likely to find around here are Chianti, Valpolicella, Bardolino and Montepulciano d’Abruzzo. I have seen the occasional Barolo and Barbera and a few of the so-called “super Tuscans” but not many. As to whites, you’re probably limited to Soave, Frascati and Orvieto. And that’s about it. Sometimes Trebbiano shows up but it can occasionally be a bit dodgy so I tend to leave it on the shelf. Strangely enough, the sparkling wine known as Prosecco seems to be available almost everywhere and makes a jolly good alternative to champagne if, like me, you are not prepared to fork out well over Bt 2,000 for The Real Thing. The two wines this week are named after the sixteenth-century Venetian palace of the Grimani family, or at least that’s what the picture on the label seems to show. They share the doubtful distinction that both their names are frequently misunderstood. 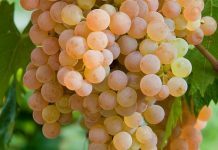 Contrary to popular belief, Soave (SWAH-veh) is not a grape variety nor is it a style of wine, even though the name implies a soft and smooth drink. But no, Soave is actually a place. 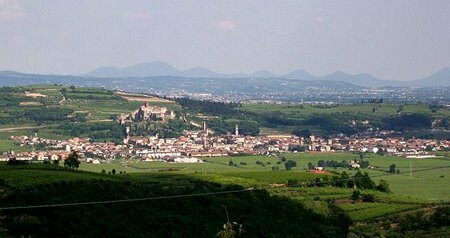 It’s an attractive historical town, nestling among the hills near the A4 about twenty-five miles east of Verona. I’ve always enjoyed Soave (the wine I mean, not the town) because on many occasions, a fairly plain and simple wine with certain kinds of food is just right. For decades, dry and refreshing Soave has been Italy’s most popular white wine. But in some ways this one is rather atypical because it has more flavour than the rather watery Soave I recall from yesteryear. Even so, it’s a very pleasant wine and I suppose you could call it a modern take on the “clean and lean” image of traditional Soave. It’s as though the Plain Jane of Italian white wines has slapped on some make-up and got tarted up for the ball. There’s a lovely aroma of white flowers and honey that fairly wafts out of the glass. Soave is always served very cold and traditionally made from 70% Garganega grapes which are widely grown in the Veneto region and produce elegant wines with hints of almonds. But there’s also a honeyed, buttery aroma and I’d bet you anything that there’s a good dollop of Chardonnay in there too. It’s only 12.5% alcohol content which makes it an easy-drinker, light, dry and soft on the palate with a lingering finish. If you prefer your whites round and slightly fruity, this would go well with many Thai dishes and fully-flavoured fish. Although you could be forgiven for assuming that Bardolino (bar-doh-LEE-noh) is the name of yet another Italian grape, like Soave it’s a place. To be more precise, it’s a small and rather pleasant town on the eastern shores of Lake Garda, about a hundred miles west of Venice. The cool and fresh climate produces wines that are light and fruity (or supposed to be) with a sharp cherry-like herby flavour. The wine is nearly always made from three grapes, all with attractive names – Corvina, Molinara and Rondinella. 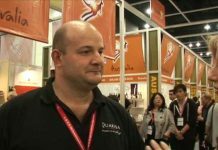 Interestingly, the same trio is used to produce Valpolicella but the wines are very different in style because of the different proportions used in the blend. Bardolino usually contains rather less of the body-building Corvina. The wine is a ruby-red with the aromas of redcurrants, cherries and a typical herby tang of brambles. It’s very dry and light-bodied and the touch of tartness gives it a refreshing quality which is just what a Bardolino is supposed to have. There’s quite a bit of red fruit on the palate and the slightest dash of soft tannins. It’s only 12.5% alcohol content, and very much a food wine. If you enjoy pasta, this wine makes an excellent accompaniment because it provides a good contrast to the texture. It was a perfect partner for a recent home-made Tagliatelle alle Erbette, served with a rich, creamy mushroom sauce to which ground dill seeds, nutmeg and a few bits of hot red chili had been added to give it a bit of joie de vivre. For colour and extra flavour, I sprinkled a few fresh bergamot leaves on the top. The dogs loved it.